Below is a photo of a lynching on the Ripley courthouse square. The photo’s caption lists a date of 1897. 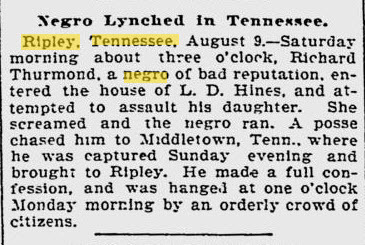 I searched through newspapers and have not yet located a mention of a hanging in Ripley, TN in 1897. 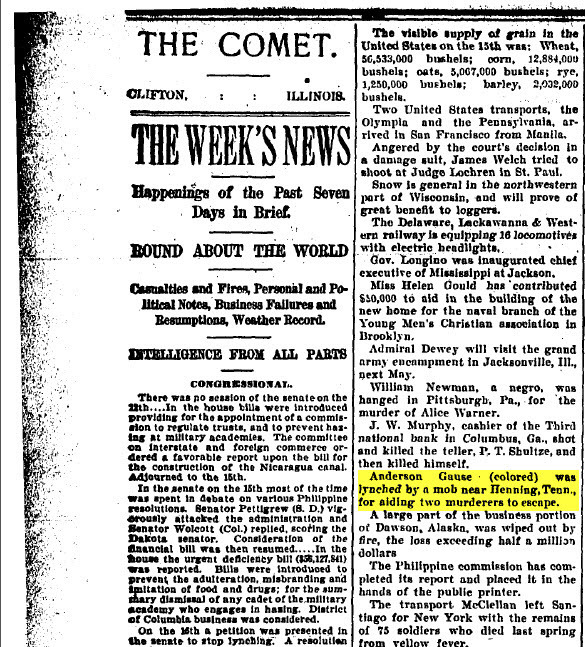 However, I found a mention of the lynching of Richard Thurmond in The Daily Capital Journal of Salem, Oregon reported August 9, 1898. Is this year of this photo mislabeled? Could this be Richard Thurmond? Adding more pieces to this puzzle is the fact that The Saint Louis Post-Dispatch reported this murder as occurring in Ripley, Mississippi, which also happens to be only a 30 minute drive to Middleton, TN where Richard Thurmond was captured. A quick search through census did not return any favorable leads connecting Richard Thurmond and LD Hines to Ripley, TN or Ripley, MS.
From the Washington Progress (Washington, North Carolina) January 17, 1901 edition. Louis Rice’s crime was that of testifying in favor of his friend, Henderson House, in House’s murder trial. House had been accused in the murder of Duncan Goodrich, a white man, after a fight that occurred during gambling. 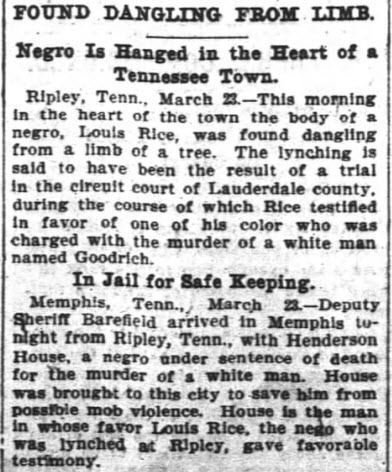 House was lynched for the crime and his friend Rice was lynched March 23, 1900. What makes this interesting is that House was not lynched until September 18, 1900. The accused lived longer than his friend who testified for him. When looking at the dates of the lynchings of Rice and House it occurred to me that this all took place in 1900. January 1900 was the date of what could be called Lauderdale County’s most infamous lynching, that of the Gingery Brothers. It is safe to say that after an incident like that that the people of the county would be on edge. It amazes me that Rice was brave enough to even testify in the trial given what the atmosphere of the county would have been like at this time. My attempt to find out more about Louis Rice was unfruitful. Rice was a very common surname for Lauderdale County during this time. Unfortunately for my search I found more than a few Louis/Lewis Rices between Lauderdale and Haywood counties. Because he died in 1900 it is unlikely that he would have a death certificate. So what do we know about Louis Rice? Margaret Vandiver in her book, Lethal Punishment, points out some interesting things to note in both the cases of Louis Rice and Henderson House. – Had been described by various newspapers as a physician. Had also been described as having committed a murder himself prior to this. – His only offense was taking too much of an interest in the case. Apparently, he had taken it upon himself to interview witnesses and submit affidavits through an attorney with more evidence that would have possibly proved House innocent. – Some in Lauderdale County “greatly regretted” and “deeply deplored” his lynching. – A petition was started by white citizens of Lauderdale County and Shelby County, TN to spare him the death penalty. Hundreds of signatures were sent to the governor. Whites of Lauderdale County and Shelby County, TN (where House’s family lived) believed another man, Alf Halliburton, to have truly been the shooter. Alf Halliburton had been acquitted of any wrong doing. – Tennessee’s Governor, Benton McMillin, refused to commute the sentence despite the efforts of locals and House was ultimately lynched. 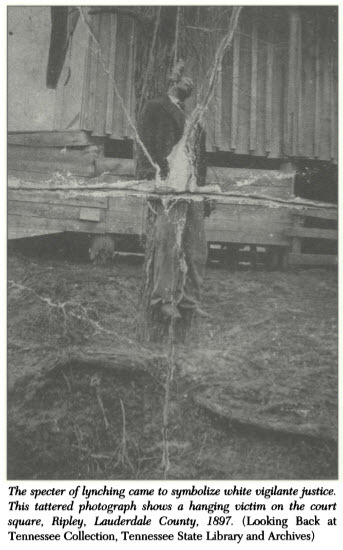 Rice was lynched for trying to free House and that cause was ultimately picked up by whites in Lauderdale County who later tried to do the same thing after Rice’s death. Lation (or Ligon) Scott was murdered in Dyersburg, Tennessee December 2, 1917 after ten days on the run. He was tortured and then burned at the stake. His charge was that he had attacked the white woman that he worked for. When I read of Mr. Scott’s torture and subsequent death it gave me chills. What I also think about is how people participated in the acts as if there was nothing wrong with what they were doing. According to the NAACP’s investigation of his death he was poked and prodded with fire pokers. He had his eyes burned with a fire poker, he was castrated, his flesh was branded and burned. Next, they lit a fire and watched him burn to death. Mr. Scott’s lynching was turned into a spectacle with many of Dyersburg citizens attending. There were descriptions of children leaving Sunday School to attend the lynching. One of the citizens was quoted as saying “The best part about it was the burning. This hanging kills too quick”. I wanted to find out who Lation (or Ligon) Scott was. I searched through US Census Records for Dyer County for 1900 and 1910 and found no record of him. I also searched for a death certificate and found no record of him there either. The article in The Crisis mentioned that Ligon was a preacher with the Holy Roller Church. It also mentions that he was included in the selective draft, so I searched for his World War I draft card and finally found him. Lation Scott was born December 25, 1893 in Holly Springs, Mississippi. He had a 3 year old child and was living apart from his wife. He listed himself as a self employed farmer. He was living on what appears to say RFD #2 in Dyersburg. His draft registration card was completed June 5, 1917. I then turned to the Sanborn Maps for Dyer County and discovered that maps were available for 1914. Sanborn Maps were not published again until 1929, so I decided to stick with the 1914 maps. As you know, Sanborn Maps show structures so it would be easy to identify a vacant lot. Do I know that the lot was still vacant in December of 1917? I do not, but at least I can find a starting point for further research using the 1914 maps. 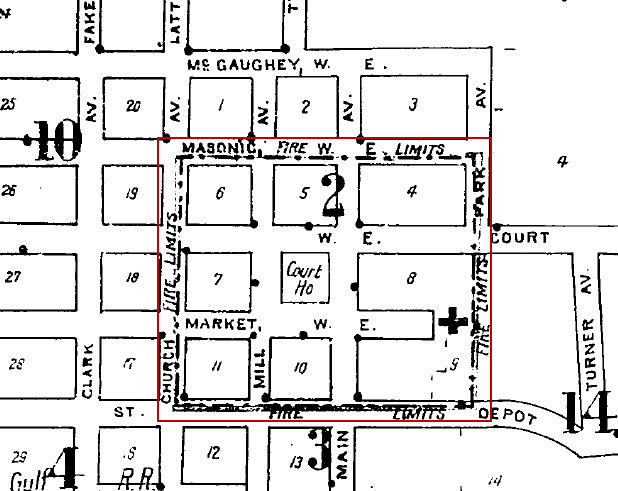 Using different sheets of the Sanborn Maps gives us a closer view of Court Square. The image below is Sanborn Maps 2 and 3 combined to give us a better view of Court Square including the buildings and vacant lots. 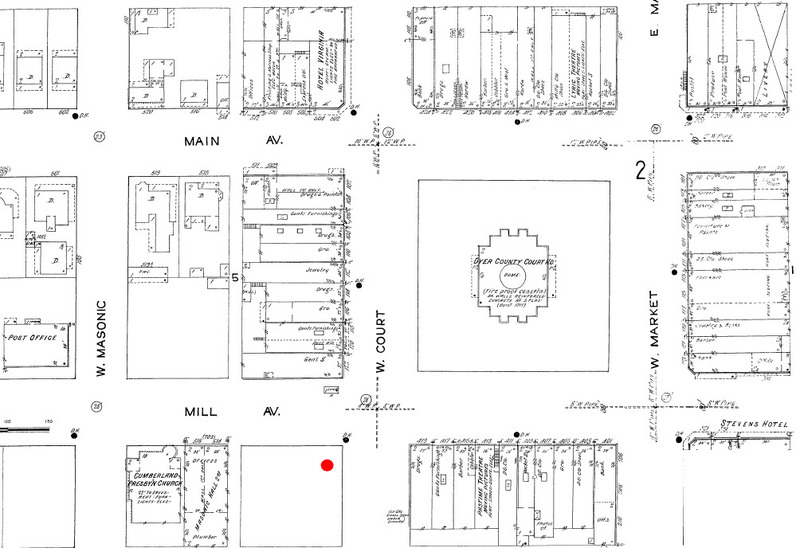 Combining the two maps lets me see that the only vacant lot near Court Square was at the corner of Mill Avenue and West Court indicated by the red dot on the map. Using the description in The Crisis we can see that (1) the corner of this lot does adjoin the public square, (2) it is near two churches (one of them shown) and (3) the court house and post office are in sight. So if this in indeed the lot where this horrible crime took place then the address of that lot is 107 N. Mill Avenue. Using the information on the WWI draft card a search for Mr. Scott on the US census should be tried again in an effort to locate his family members. I did a preliminary search for an African American male born in 1893 living in Holly Springs, MS with the surname Scott and there were a few hits, however none had the first name Lation or Ligon. Perhaps he also had another name that he went by as a child. Also, newspaper accounts of this incident should be viewed to locate any clues such as the name of the family he worked for and those he associated with in Dyersburg. Hopefully more can be done to discover Mr. Scott’s background, the family he belonged to, the identity of his wife and child, and where he might be buried. – Sources: The Crisis by NAACP Volumes 15 – 18, Sanborn Maps Dyersburg, TN 1914 (Index Key Map 1, Map 2, and Map 3), US Census Records for Dyersburg, TN 1900 and 1910, Tennessee State Deaths and Burials Index 1874-1955, US World War I Draft Registration Cards, Google Maps for 107 North Mill Avenue. I covered the kidnapping and lynching of Albert Gooden of Tipton County about a year ago. That article can be found here. Interesting to note I couldn’t locate a death certificate on Mr. Gooden. There is also an article on Elbert Williams of Haywood County on the Pan African News site. I’ve been writing a piece on him to be published on this site in the future. I have featured stories about two of the Gingery brothers, Roger and Henry, on the blog before related to the mob action taken against the family following the deaths of W.D. Turner and Marvin Durham who were taking Reuben Gingery to be vaccinated. I’ve since discovered a new story related to the Gingery family based on search terms used in search engines that lead readers to this website. Dupuy Gingery was born about 1888 to Tom and Julia Gingery. At the time of the mob action he would have been around 11 years old. At this age he would have seen two of his brothers, Reuben and Frank, hung and his other two brothers Roger and Henry vanish. Later in this year his other brothers (more research is needed to fully confirm that they belonged to the same household), Thomas (14) and Jessie (13), were both in jail in Lauderdale County, Tennessee. Using available records it appears that Dupuy might have had a bit of a rough childhood. The 1900 US Census lists him as being a day laborer while his neighbors his age are listed as school students. This is easy to understand given the fact that all the men in his family with the exception of his younger brother John were gone. On January 15, 1911 Dupuy married Linnie Taylor. Linnie Taylor was the daughter of William Taylor. On Dupuy’s WWI draft card he indicated that he was working as a farmer on William Taylor’s land and that he and Linnie had 2 children under the age of 12. Using the records I can see that after this things took a turn for the worse. On July 4, 1917 according to the cause of death on his death certificate Dupuy shot and killed his wife Linnie and then shot and killed himself. He was 29 years old. She was only 22. On the 1920 census his children, Roger and Marvin, are listed under the household of his father in law William Taylor. Their names are listed as Roger Gingery Taylor and Marvin Gingery Taylor. It appears as if maybe Dupuy named his son Roger after his older brother who had vanished following the mob incident. When I heard of this incident I was saddened. Dupuy and Linnie were both so young and they left behind 2 young boys. In addition this family had already experienced so much tragedy. The Gingery Mob – Who Was the Accomplice? About a year or so ago I wrote about an event known as The Gingery Mob in which the Gingery brothers, Henry and Roger, killed a police officer and his helper because their brother Reuben was arrested for failing to be vaccinated. Henry and Roger escaped, but their brothers Reuben and Frank were killed for their crimes. In addition to this a man from Henning identified as a neighbor of the Gingery’s was also killed for being an accessory to the crime. Just who was the accomplice from Henning? Sometimes the answer we are looking for is right under our nose and in this case it was. I have a list of the lynchings that occurred in the West Tennessee area, of course the listing is incomplete, but it didn’t occur to me until now to check that list and see who was hung around the time of the Gingery Mob. Wouldn’t you know it? My answer was on that list. 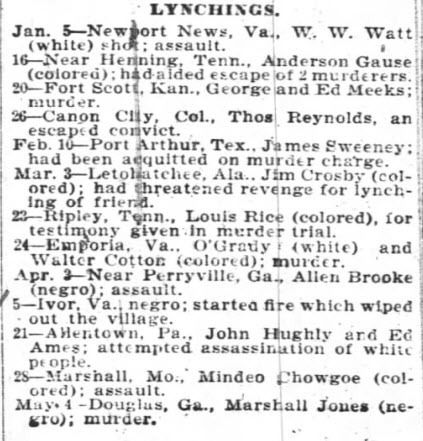 Anderson Gause was lynched January 16, 1900 just 7 days after the Gingery brothers. Could he be the accomplice? With my idea corroborated by published news accounts I figured that this was my guy the accomplice, but just who was Anderson Gause? Ordinarily you would think that tracking down someone named Anderson Gause would not be that complicated, but there were a lot of people with the last name Gause in Lauderdale County at this time, Black and White. United States Census Records did not provide the best information because several people just listed themselves on the census as “A. Gause”. I then decided to check the Tennessee State Marriage records, but in those records I also found a lot of people named “A. Gause” listed. So then I decided to check FindAGrave.com to see if there was an A. Gause listed in Bethlehem Cemetery, Canaan Cemetery, or Canfield 2 places he possibly would have been buried since he was killed in Henning. I turned up no records on Find A Grave and of course no Tennessee State Death records because he died before death records became mandatory. Just who was Anderson Gause? How did he help the Gingery brothers escape? Did he help them get onto a train? Take them by wagon to another city? Give them his horses? Did he even help them or was he just at the wrong place, at the wrong time while the community was looking to kill anyone who might have remotely had anything to do with the Gingery brothers? Who knows for sure, but as always I will be sure to share more information as it becomes available.